Since I moved the blog over to Google's Custom Domains I've had to accept Blogger's navbar across the top. I can't complain. Anyone can plainly see that I'm no design guru! The Next Blog » interests me. It takes people off the site. It's like an old webring button. BlogSpot readers should be able to skip from blog to blog. Well. That's the theory. There's a lot of crap in there. 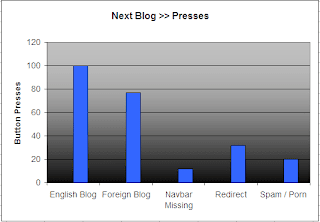 I decided to count how many Next Blog » clicks it would take me to visit 100 English language blogs. It took 241 clicks. Here's a break down of a lazy Sunday hour. Foreign language blogs did not interest me but if Blogger wishes to include them then I don't suppose they strictly count as a failure. It's certainly possible for Google to check that a blog has the navbar before including it in the Next Blog ». Humble webrings do this. Google Analytics does this. Of the spam and redirects out of the system there were two culprits who kept on coming up. Of the 32 redirects 15 went to JokesNJunk.com and 16 went to LookUpLive. JokesNJunk can still be found in Google. If you search for LookUpLive on Google there is just a diatribe of complaints about them. I don't think Blogger should just look at taking out the spam. I think Blogger should enhance the button. I would be happy to fill in a little preferences poll and then enjoy a Next Blog » akin to StumbleUpon. In fact, since I surf with Google's personalised search then shouldn't Google already be able to to direct me to random but interesting blog. Until that day the Next Blog » is simply incentive for people to spam the system. I thought there was some sort of spyware or virus on my system since I was hitting these spam sites so often. But finding spam sites like this seems to be a new feature in the next blog option. It used to work pretty well. Are you as sick of the spam blogs as I am? So many have computer generated gibberish for names and the redirect to jokesnjunk. Interestingly, google doesn't provide a "contact us" link. They said that "Automated spam classifying algorithms keep spam blogs out of NextBlog and out of our "Recently Published" list on the dashboard." Looks like that spam filtering algorithm is not as intelligent.